Watch: Miss Colombia's Statement After the Miss Universe Big Screwup! 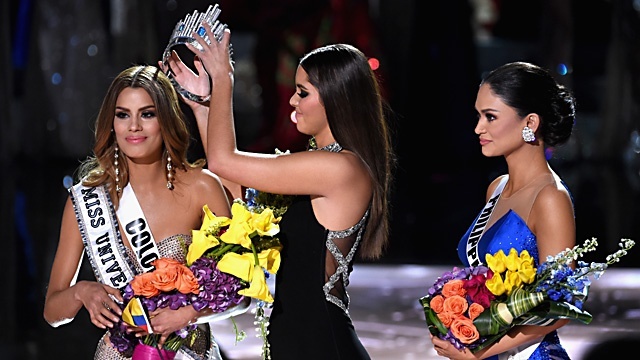 After announcing the controversial winner for Miss Universe 2015 of the host Mr.Steve Harvey who has mistakenly announced that the winner is Miss Colombia which is supposedly the Miss Philippines. The crowd became so intense after he committed his mistake. It was the most awkward and failure moment for the legendary pageant. Everyone was so surprised after the unexpected announcement. Many people are now giving their own comments about what happened, and many are too curious to know how Miss Colombia handle the situation. This video was the interview to Miss Colombia at the back stage. Watch how she respectively accept the situation. OK. Why did she use an interpreter if she herself is fluent in English. Who are the extras in the background? Miss India (loser that stinks, others ignore them. The others who disrespected Miss Phil are sore losers, join Columbia in shame bithches! Hahaha All I have to say is never mind the stinking attitude of this other candidates. Im really proud of you Pia, you've shown a side of a Real Filipina! She can speak english pala eh. bakit nagpatranslate pa siya sa q and a? Yung katabi niya parang flaslight ang mata. Listen and watch how Miss Colombia speaks in English. The reason why she needed an interpreter because she doesn't know how to speak English well. But to have an interpreter is a tactic so that the interpreter will say it beautifully and will add words on to it to make the sentence more significant and meaningful. But not at this time. sorry it did not work hahaha. Better speak in English and say it from your heart and you will surely win. Congrats Pia you deserve it!!!! Dont mind those childish girls or candidates who were acting rude because they are insecure. The reason why they didn't even on the top because they don't have the qualities to be the Miss Universe 2015.